We could have a lot more of Tom Hardy as Venom in the future, assuming the first movie goes over well. Sony is currently doing their best to make use of the Marvel characters they have at their disposal, all of which are at least tangentially related to Spider-Man. Sony made a deal for Spidey to appear in the Marvel Cinematic Universe, but that left them with a lot of characters just sitting and they have hopes of being able to launch their own universe. 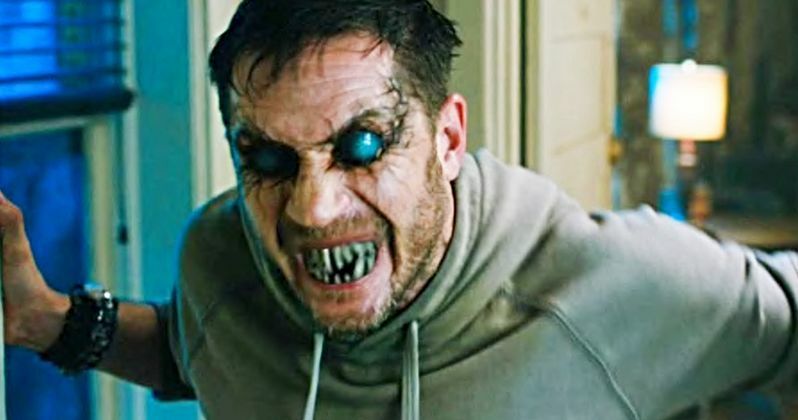 That starts with Venom and, according to Hardy, he's locked down for three movies. Potentially. Tom Hardy was recently interviewed about his upcoming role in this comic book movie. During the interview, he made the reveal that Sony has locked him down for a three-movie deal. That's not to say Tom Hardy will definitely be in three of these Spider-Man spin-off universe comic book movies. Hardy does admit that he loves playing the character, but really, he's just along for the ride and is happy to do whatever comes his way, assuming Venom actually does well with moviegoers. Here's what he had to say about it. "We've signed up for three of them. So it's very much an open case. We'll see what people's responses are to it. I think it's an awesome character. I love playing both of them. It's an amuse-bouche, and for Sony, it's the Venom-verse launched in isolation, as it were. We all prepped for it to be a standalone universe. So whatever Sony want to attach to it at a later date, it's a fulcrum piece. But let's see what happens when it lands." As it stands, Sony is planning other movies such as Nightwatch, Morbius, which will star Jared Leto as the titular character known as The Living Vampire, a Kraven the Hunter movie and several others, such as Silk. They had hatched plans for Silver and Black, which would have seen Silver Sable and Black Cat team up. That has been scrapped in favor of developing solo movies for both of those characters. In any case, they have a lot of characters to possibly expand this universe with. And, even though Venom exists on its own, Tom Hardy could possibly pop up in one of these other movies. What's particularly interesting is that, in another recent interview, Tom Hardy indicated that he is considering retiring from acting. He's very in-demand and is arguably at the top of his game, so that would be surprising, if he ultimately did decide to hang it up. But he is under contract with Sony and his tone here seems to be much more optimistic. For now, the fate of this possible cinematic universe rests on Venom's shoulders. The movie comes from director Ruben Fleischer (Zombieland) and is set to arrive in theaters on October 5. This news comes to us courtesy of Total Film Magazine.